CHIANG MAI, Thailand - Seabees assigned to Naval Mobile Construction Battalion (NMCB) 5 arrived in Chiang Mai, Thailand to begin construction of a schoolhouse at the Ban Piang Rat School Jan. 19. 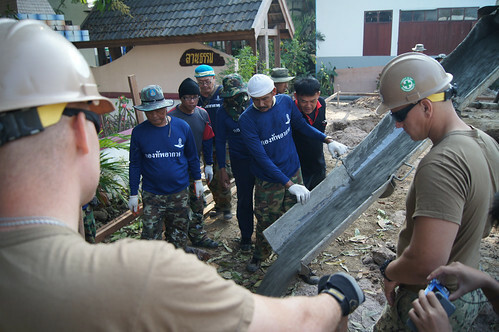 The Seabees are working alongside the Royal Thai Air Force to complete the project as part of Exercise Cobra Gold 2013. Exercise Cobra Gold is an annual joint multinational exercise conducted in the Kingdom of Thailand designed to improve joint and multinational operations, including humanitarian civic assistance events. One of the byproducts of the Chiang Mai school project is that the Seabees get to learn more about the Thai culture and build relationships with the people. "It is super important to me to get to know them and know their culture," said Builder Constructionman Brittany Barlow. "I am looking forward to making a difference in the community and leaving something behind for them to remember." In addition to Seabees from NMCB 5 and the Royal Thai Air Force, Malaysian Army Construction Engineers and Tentara Nasional Indonesia will take part in the exercise. Through this collaboration, the Seabees will continue to build relationships with their Thai, Malaysians, and Indonesian equivalents through various construction projects and cultural interaction. "I look forward to working with Thai counterparts and strengthening our interoperability between our forces. We welcome the opportunity to experience the Thai culture," said Chief Steelworker Mike Bonifer, Detachment Assistant Officer in Charge. This year's Cobra Gold exercise is scheduled for Feb. 11-21. Particpating nations include: Kingdom of Thailand, United States, Singapore, Japan, Indonesia, Republic of Korea and Malaysia.